The European car of the year is a Japanese car. That’s not the first time it happens, the Nissan Micra won that title in 1993, but there’s something really new this year, for the first time ever, an electric car wins the title. It’s a Nissan again, it’s the Leaf. That is an important step into making electric cars a success story, and it wasn’t an easy win. 59 jury members from 23 countries made the vote. 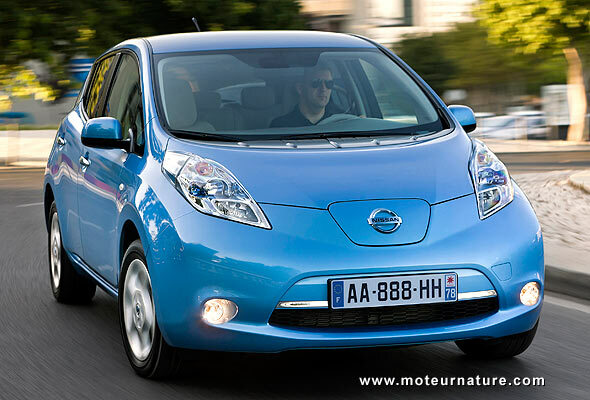 Some gave the electric Nissan the most points, while some others didn’t gave it any. Not everybody’s convinced by the Leaf… Still, this car is a breakthrough as it’s the first real electric car on the market. I know the Tesla roadster, and the Mitsubishi i-MiEV have been available for a while, but these are gasoline cars converted to electric propulsion, whereas the Leaf was purpose-built for an electric drive. You can’t retrofit it with a gasoline engine. This is what makes it so good, and a real contender to gasoline cars for those who don’t drive much. Because of that, the Nissan Leaf fully deserved the car of the year award, even when the car won’t be available before late next year for many European people.